The NASC has announced the results of its Apprentice of the Year 2016 Award at its Annual General Meeting in Amsterdam (Friday November 25th) – with Kier Phur TRAD Scaffolding Co Limited winning, Lisa Duncan of A & J Maintenance Support Limited named as runner-up and a posthumous special mention going to Mike Towell of Interserve Industrial Services. A trophy and a cash prize of £500 will be awarded to Kier Phur, whilst his employer TRAD Scaffolding Co Ltd will also receive a trophy and £500 – to be spent on scaffolding training with a CISRS approved training provider in 2017. Now in its third year, the Construction Industry Training Board (CITB) and Construction Industry Scaffolders Record Scheme (CISRS) sponsored NASC Apprentice of the Year scheme is aimed at individuals who are directly employed by an NASC Member company and are either part way through a formal scaffolding apprenticeship with an approved CISRS provider, or alternatively have successfully completed the apprenticeship programme in 2016. For details about scaffolding apprenticeships, becoming an NASC member and to find out more about the latest SG4:15 ‘Preventing Falls in Scaffolding Operations’ Safety Guidance notes, the TG20:13 full suite and the NASC – the UK scaffolding industry trade body – please visit www.nasc.org.uk or email: enquiries@nasc.org.uk. And for more details on CISRS training, scaffolding apprenticeships and a list of current providers, please visit: www.cisrs.org.uk. 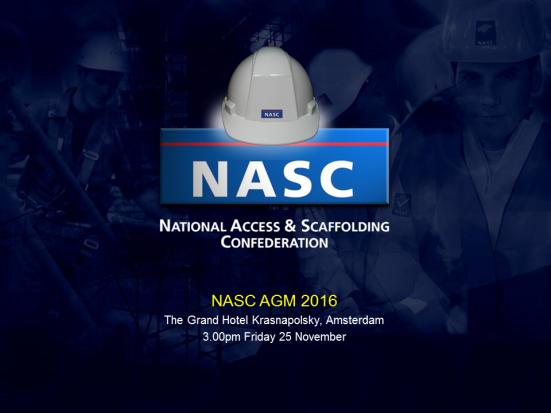 The NASC held its AGM at the Grand Hotel Krasnopolsky in Amsterdam on Friday November 25th – releasing a range of news from the UK scaffolding industry trade body, including a record level of membership. The busy agenda – reflecting the high activity levels of the confederation and its membership – included speeches from President, Alan Lilley (Commercial Scaffolding Ltd), Vice-President and Chair of the NASC Hire, Sale & Manufacturing Committee, Des Moore (TRAD Group MD), Training Director & CISRS Manager, Dave Mosley and NASC MD, Robin James, to a full audience of NASC contracting, hire and sales and information members. Addressing the membership, MD Robin James provided a 2016 Annual Review with updates on the activities of the various standing committees (Audit, ASITO, Health & Safety, Technical, Hire, Sales & Manufacturing, Contracts), updates were also provided on Employment Affairs & Marketing. Record levels of membership since the confederation formation in 1945: The total number of full members is now at 229 – which is a record high. And with two companies in the site audit process currently, the confederation expects to breach 230 by the year end. 2016 NASC Apprentice of the Year award winner: Kier Phur TRAD Scaffolding Co Limited winning, Lisa Duncan of A & J Maintenance Support Limited named as runner-up. And a special posthumous mention going to Mike Towell of Interserve Industrial Services. Approving a special resolution to adopt new Articles of Association for the NASC, to modernise the confederation and embrace its status as a not-for-profit organisation. President, Alan Lilley said: “It is with a sense of pride that I can say our mission over the past year to help companies meet our strict criteria and become NASC members has worked, cementing our position as the premier trade body for access and scaffolding in the UK. 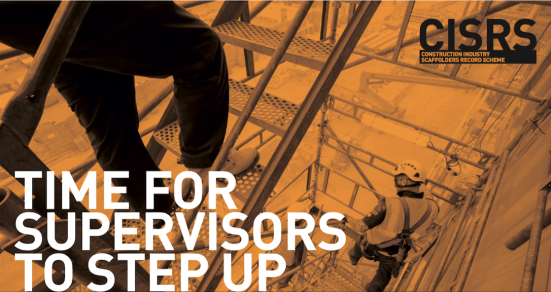 For details about becoming an NASC member and to find out more about latest SG4:15 ‘Preventing Falls in Scaffolding Operations’ Safety Guidance notes, the TG20:13 full suite and the NASC – the UK scaffolding industry trade body – please visit www.nasc.org.uk or email: enquiries@nasc.org.uk. 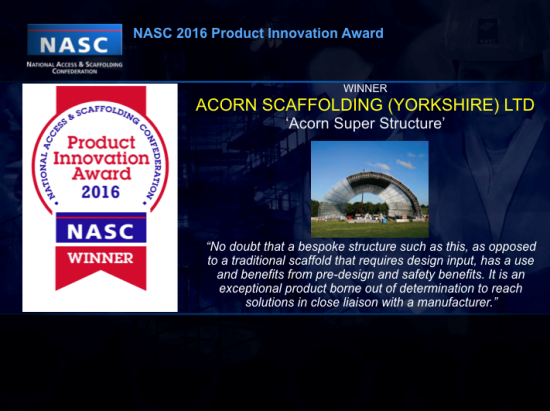 The winner of the inaugural NASC Scaffolding Product Innovation Award has been announced at the confederation’s AGM as Acorn Scaffolding (Yorkshire) Ltd – for their impressive £1.8M 50m (w) x 20m (h) x 90m (l) ‘Acorn Super Structure’ temporary roof at the Creamfields Steel Yard event this Summer. And a highly commended NASC Product Innovation Award has been given to TRAD Scaffolding Co Ltd for their revolutionary ‘Big Ben Braked Gin Wheel’ – designed to stop scaffolding loads plummeting from height. There were eight entries for the inaugural biennial NASC Scaffolding Product Innovation Award – launched this Summer to celebrate the very best developments in new scaffolding materials and products from inventive NASC members at the forefront of change in the UK scaffolding industry. Focus Scaffolding Ltd for their two and three board hop-up bracket for tube and fittings. The winners were announced at the NASC AGM in Amsterdam, on Friday November 25th, where trophies and certificates were presented. And in addition Acorn and TRAD will now be able to use a bespoke NASC Product Innovation logo for a period of two years. At the AGM, Des Moore, NASC Vice President and Chair of the NASC Hire & Sales Committee gave a presentation on the various entries, showcasing cutting edge products to the membership and the scaffolding industry as a whole. Speaking about Acorn Scaffolding (Yorkshire) Ltd, the judges said: “Acorn came through in creating an innovative structure using an innovative product. 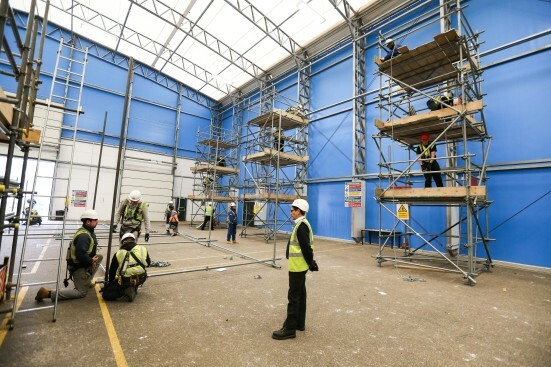 Their aim is to help clients deliver world class, unique and memorable events –specialising in innovative, temporary scaffold-based event structures. Their brief was to push the boundaries of festival production. Runner-up, the TRAD Scaffolding Co Ltd ‘Big Ben Braked Gin Wheel.’ was highly commended for its wide-reaching benefit, ensuring that loads do not go into free fall, and for radically reduced rope chafing characteristics. The judges said: “By applying designs from other industries to our trade and enhancing the safety of this commonly used lifting accessory, TRAD evolved this clever item through their in-house ‘Play it Safe’ safety meetings. It was seen as a major benefit to the whole of the industry – ensuring loads cannot plummet, which is a real innovation and safety feature. The NASC has made changes to its Council structure – with Alan Harris (Pro-Fix Access Ltd), Sean Pike (Layher Ltd) and Rob Lynch (Lyndon Scaffolding plc) elected as co-opted members of the NASC Council, effective for two years from the confederation’s AGM, November 25th 2016. 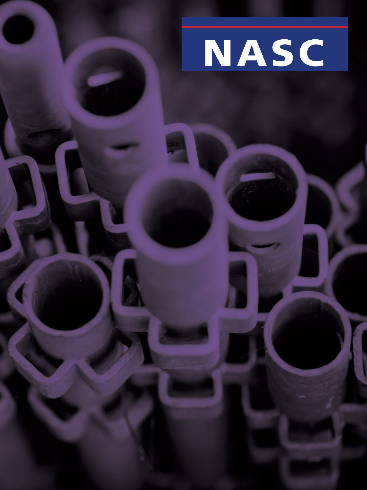 In addition to its standing committees – which work tirelessly to create industry-leading safety and technical guidance for the benefit of members of the UK’s leading scaffolding industry trade body – the NASC has an elected council which oversees and provides all of the NASC activity and provides direction and strategic decisions. In addition to these changes, Mel Archer (Archway Services plc) was elected as Audit & Membership Committee Chair and Lee Rowswell (GKR Scaffolding Ltd) was elected as London & South East Region Chair. 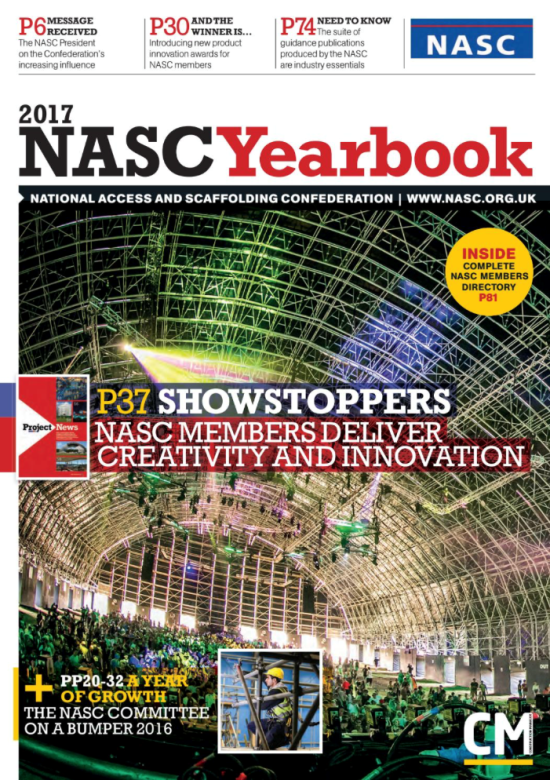 The inaugural NASC Scaffolding Product Innovation Award was launched in the summer of 2016 and has attracted entries from a range of NASC hire/sale and contracting members, showcasing a range of innovative scaffolding products developed by the membership. This biennial NASC award is designed to celebrate developments in scaffolding products by NASC member companies. It is hoped that all NASC member companies will be able to benefit from the exercise. All the entries have been forwarded to the judging panel which is comprised of Rick Statham (Safety & Access Ltd) and Simon Hughes (Simian Risk Ltd) with Ken Johnson (NASC Health & Safety and Technical Support) the point of contact for judging. The primary focus of the judges when assessing the entries will be on innovation, safety and commercial benefit. Winning and highly commended entries will be announced at the NASC AGM on Friday November 25th, when trophies and certificates will be presented by Des Moore (TRAD Group MD and Chair of the NASC Hire & Sales Committee) after he has given a presentation about the various entries, showcasing the shortlisted products to the membership. In addition to the award (which will alternate with the well-established biennial NASC Health & Safety Award) the winning and highly commended entries will entitle the respective member companies to the use of a bespoke NASC Product Innovation logo for a period of two years following the awards. CISRS are working directly with their cardholders and approved training providers to match up the demand for supervisor refresher training. Following the introduction of Supervisory CPD/refresher training on 1st March 2016, anyone wishing to renew their CISRS Scaffolding Supervisor/Manager card is required to complete the newly developed 2- day course. Delegates on the two-day course will need to successfully complete a written test, several case study projects, and deliver a toolbox talk – all of which will contribute to their overall pass/fail assessment criteria. SMSTS is often the client’s default position when it comes to specifying Supervisory qualification on their sites, as such lots of scaffolding Supervisors are attending generic Health and Safety Supervisory courses rather than a scaffold specific one. CISRS has announced that it will allow those operatives holding a current SMSTS certificate, a valid CISRS Scaffolder or Advanced card and a Supervisory Health, Safety and Environment test or recognised exemption to attend the CISRS 2 Day supervisor refresher course. Those who successfully complete the programme will be deemed eligible to apply for a CISRS Supervisors card. 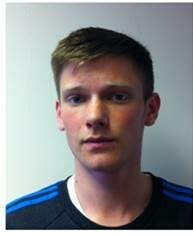 CISRS Scaffolding Supervisory and Manager training is recognised by Build UK. To find out more about the CISRS scheme, please visit www.cisrs.org.uk or email enquiries@cisrs.org.uk. 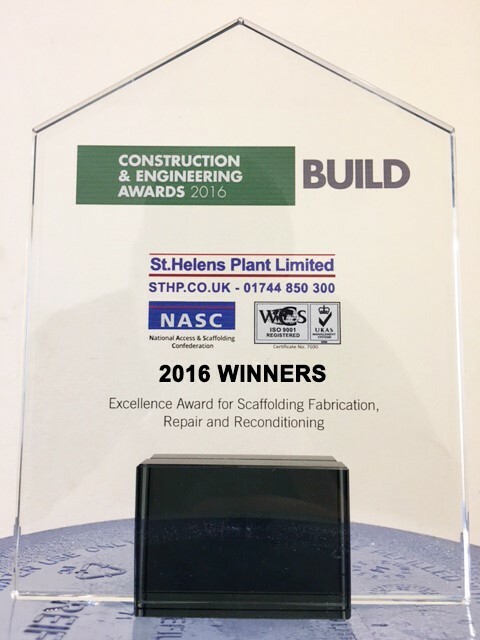 NASC full non contracting (hire/sales) members St Helens Plant have won the construction and engineering category plus an ‘Excellence Award for Scaffolding Fabrication, Repair and Reconditioning’ in the recent Build Awards 2016. This is the second accolade that St Helens Plant (known in the scaffolding sector for their fabrication, repair and reconditioning services) have won in 2016 – also netting a finalists placement in the Access and Scaffolding Specialist of the Year category in the Construction News 2016 Specialists Awards in February. As one of the UK’s all-encompassing scaffolding supply specialists, St Helens Plant have gained national and international recognition for their commitment and contribution to the access and scaffolding industry. Gordon Pilling of St Helens Plant said: “We’re delighted to have been nominated by our clients, and to have won this construction and engineering award, also to have gained an excellence award for scaffolding fabrication, repair and reconditioning. “It’s another award purely down to the strength, commitment and loyalty of each one of our team, from factory, dispatch and delivery, and office staff. We are very proud of all of who commit daily to St Helens Plant and have made our international recognition and awards possible. I extend my gratitude to our clients and the Build Awards for the privilege of being awarded this accolade. CISRS has tightened up the entry criteria and course requirements for its popular basic Scaffold Inspection Training Scheme (SITS). Effective immediately, there is now a pre-qualification requirement that the delegate/employer must ensure they can provide evidence of a minimum of two years relevant industry experience prior to attending the basic SITS course. Aimed at anyone responsible for carrying out statutory scaffold inspections on basic scaffolding structures in accordance with the Working at Height Regulations 2005 – as well as scaffolders wishing to expand their knowledge – the basic SITS course is one of the most intensive courses within the CISRS scheme, which entails three full days at an accredited training centre to complete. The popular SITS courses are attended all across the UK by site managers, agents, engineers and health and safety professionals alike – covering the fundamental requirements for legal, safe and compliant scaffolding. The courses include practical inspection, theory, report writing, fault finding as well as an update on the latest NASC safety and technical guidance. CISRS Scheme Manager, Dave Mosley said: “Scaffold inspection is such an important area with far-reaching effects and we feel that those attending the course should be able to verify that they have at least a rudimentary knowledge of scaffolding prior to attending training. They also need to be aware of the responsibility that comes with inspecting scaffolds – hence the pre-qualification change to two years relevant work experience. As a result of the changes to the Scaffold Inspection Training Scheme, potential delegates will be required submit a CV, employer endorsement and/or proof of prior training at the point of booking a course. CISRS are considering the possibility of putting together a short duration scaffolding awareness course, for entry level training purposes. For more information on SITS courses, a full a list of approved training providers, further details about CISRS scaffolding card courses, a copy of the new CISRS cards poster, training changes following the introduction of SG4:15 and TG20:13, information and dates on courses available or to find out more about CISRS, please visit www.cisrs.org.uk or email enquiries@cisrs.org.uk.